PropBlurs: I invented The Original PropBlur in 2000. I make PropBlurs in California. I make 2 TYPES of PropBlurs - see below. I make PropBlurs in FOUR SCALES. I try to produce an affordable, high quality product. Enjoy. 1. Original PropBlurs (left) & On-Hub PropBlurs (right) are different - see pictures here. come attached to a 'frame' called a 'KIT'. KITS contain multiple PropBlur Units. ​Original PropBlurs are ONE TYPE of PropBlur. Original PropBlurs replace propellers one blade at a time. When buying Original PropBlurs, count the # of propeller BLADES. ​ You need one Original PropBlur for each propeller BLADE. Original PropBlurs come in 3 scales: 1/32nd, 1/148th and 1/72nd Scales. On-Hub PropBlurs are ANOTHER TYPE of PropBlur. On-Hub PropBlurs are used to replace an entire propeller and ALL its blades on it. One On-Hub PropBlur Unit replaces an entire Propeller. A. On-Hub PropBlurs come in 3 different Scales: 1/48th, 1/72nd and 1/144th scales. What is your model scale?. B. Count the number of ENGINES on your model. You need one On-Hub PropBlur UNIT for each engine. C. Observe how many Propeller BLADES are on each propeller. Do these propellers have 2-Blades, 3-Blades or 4 Blades? Here are a few of pictures from the PropBlur gallery page. 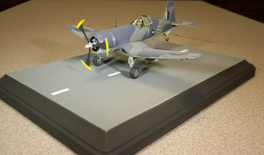 I invite all PropBlur customers to send pictures of their models to be posted to the gallery.